It's not necessary to mix 2 tablespoons of the flour with the blueberries, but it helps to make the blueberries stay whole while they bake. If you don't care about that, then by all means, just leave out that step. I really do like these muffins. They're not too sweet and that cinnamon sugar topping totally hits the spot. Preheat oven to 400F. Line muffin tins with liners. Set aside. In a large bowl, combine all but 2 tablespoons of flour with the oats, brown sugar, baking powder, baking soda and salt. Mix well. Set aside. In a medium bowl or large measuring cup, combine beaten egg, milk, canola oil and vanilla extract. Mix well. Pour liquids into the dry ingredients. Mix just until combined. Set aside. In a small bowl, toss blueberries in remaining 2 tablespoons of flour. Gently fold into the batter. 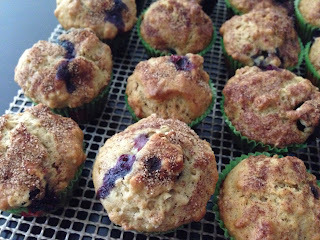 Spoon batter into muffin tins to the top. In another small bowl, combine the sugar and ground cinnamon. Top each muffin with some of the cinnamon sugar mixture. Bake in the center rack for 10-15 minutes (for mini muffins) or 20-25 minutes (for regular muffins), or until a cake tester comes out clean when poked inside the middle. Serve with (a pat of butter and) coffee.